Lookee here: a poem that doesn't rhyme! This one holds special interest for me because of the final punctuation. I could have gone with a question mark, but I chose to go with a period. I take the view that the ", I wonder," brings it out of the interrogative realm and puts it into the declarative realm. Do you agree or disagree? to see me drunk on liquor, wine, or beer. is feeling and knowing that you are near. I'm pretty much a teetotaler, in case you don't know. Beth's never seen me drunk. Actually, nobody's ever seen me drunk. But Beth has long been curious as to how I would behave drunk. I think this is one of my most successful poems. It has nice rhymes, but it has narrative integrity, so it doesn't seem (at least in my opinion) like I was stretching to make the rhymes work. Will it outlast the rain? Will it outlast the thunder? I like this one from a structural standpoint. Friday is the day when I most wish I could spend my life with you. Friday is the day when I am most thrilled that you married me. Friday is the day when I am happiest to see your smiling face. Friday is the day when I most want to hear your voice and to feel your hugging. Friday is the day when I most desperately long for your kisses. I'm pretty sure that January 22 was a Friday this year. when your hair turns white. after day turns to night. where I'll meet you tomorrow. I didn't realise just how many of these poems are gushy love poems until I started posting them to my blog. Eventually we'll get to some poems that do not fit into that category. I promise. I live life afraid of attack from a pickle. I don't understand why you're so hard to tickle. for ball in my hand with third down and just inches. I am disgusted by pickles. Beth has been known to chase me around with them, threatening to touch me with them. She's also extraordinarily resistant to tickling. She also used to pinch me quite a lot. Not so much recently. I kind of miss it, actually. The key to perfect harmony would be for her to pinch me, but not so hard that it hurts! The football reference was nothing but a stretch for a rhyme. Structurally, this one relates to number 4, but I think it's better. like your joy fills your dance. Still a little funny. But I think this was a bit of a better effort than the last one. and I still love your knees. and you sometimes say please. Getting a little funny. Not my best effort, for sure. But perhaps it has its charms. I love that you're funny. I love that you're you. Another gushy love poem. I warned you. I love you more than the finest green Jello. I actually initially mistyped "yellow" as "blue". I sent the poem that way before realising my mistake and sending a correction. The Poem-a-Day Portion of Our Program, Day One. I want to hug and kiss you. The poem, simple as it was, was made up on the spur of the moment while I was at work. I quickly followed it with another text message saying something along the lines of "that was your poem for the day". Having sent the followup message, it somehow seemed appropriate to send a second poem the next day. And so I did. Then I kept going. For eight months [so far], I've been sending Beth a new poem on a [mostly] daily basis. I won't claim the resulting poems amount to high art. In fact, I will claim just the opposite. But I think that every once in a while there is a gem or a nugget that makes the exercise seem pretty worthwhile, from the standpoint of the practice of writing. Often, the poems have been downright lousy. Still, for me, the point of the exercise has been a romantic notion. I think it's a pretty sweet thing to do for my wife. Perhaps you disagree. That's okay. Usually, the poems are very short, but sometimes I get ambitious. Mostly they rhyme, but sometimes they take the form of a haiku. Occasionally, I'll throw in something less structured. And I might even have composed a limerick or two. From time to time, when it occurs to me that my blogging has become shamefully rare, I decide to take on some new strategy for increasing the frequency of my posts. Usually, these strategies last only a short while and then I get lazy again. Well, I have a new strategy and I think it will last longer than most — largely because I already have the raw material all ready to go. So, with the permission of my darling wife [thanks to you, Beth! ], I'm embarking on a new phase of The Repeal of Gravity Blog: It is now becoming a poem-a-day blog. Today is day one. I probably won't provide a commentary for all of the poems. Perhaps not even for most. But at least the poems themselves will be available for a new post each day for the foreseeable future. I hope you will enjoy them, even if most of them are gushy love poems. [Some of you may actually like that aspect, for all I know.] As always, feedback is welcome and encouraged. Historically, my blog has been one that really does not get many comments at all. If I'm really lucky, this will be the strategy that changes that. We'll see. It's all up to you. 2) Another part of why I am doing this is because my longtime friend Birdie asked me on Facebook whether my "stuff" was published. It isn't, but at least this way I get to share it with her and anyone else who cares to read it. I have a hunch Janelle may appreciate it too. As this ninth anniversary of September 11, 02001 approached, I spent a lot of time listening to "news" programming on the Sirius while I drove around for work. I have been deeply upset about the overt bigotry that's been dominating the discourse over the last several weeks. This past week, it occurred to me that it's been over a quarter of a year since I posted anything to my blog. That, in itself is a shame. In light of the mood that's overtaken the country, it seems especially a shame that my most recent post was about having participated in Everybody Draw Mohammed Day. Don't get me wrong. 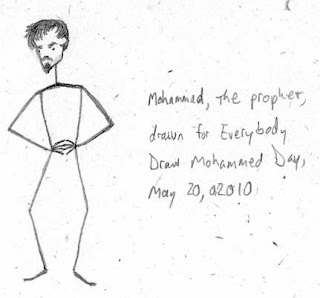 I am proud to have participated in Everybody Draw Mohammed Day. I think it was a meaningful event, and I think that it was, at least in my case [and, frankly, in its origins], a properly directed protest. Its aim had something to do with saying "intolerance is not welcome", "bullying is not acceptable", "threats against freedom of expression are unacceptable". The problem, in this case, is that my participation in Everybody Draw Mohammed Day might be misconstrued as me being on the wrong side of the sickening Islamophobia that seems to be sweeping the nation. Shortly after the event, I sought out internet postings showing drawings that were produced by other participants. I didn't spend much time at it, as I was disgusted by most of the first images I found. 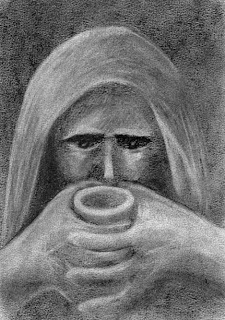 Far from being drawn in the spirit of protest against extremism, the drawings I found were examples of extremism. Far from being either respectful, helpful, or respectable; the drawings I found were made with clear intent to be disrespectful, hurtful, and [shamefully] undeserving of respect. I would post links to some of these images, but frankly I don't want to be part of exposing a larger audience to that sort of filth. I'm not even going to describe what I saw, because it was largely an affront to human creative endeavor. Still, I will not disavow or renounce my participation. I am, to this day, proud of my participation and I am proud of the drawings I produced on that day. And it turns out that participation in Everybody Draw Mohammed Day rekindled in me my love for charcoal drawing. 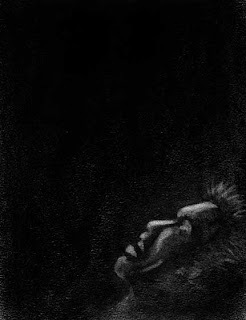 Because I drew Mohammed, I realised that charcoal drawing is important to me and that I want to do it more. So after years of not doing something that I love, I have taken up my old hobby, which brings me some joy. I hope that my Mohammed drawings were seen as being respectful. They were not intended to offend anyone's reasonable sense of decency. The only offense that was intended was an offense towards extremism, intolerance, and hatred. Now, I don't pretend that there's anything I can say here that's going to change anyone's mind about recent "news" events. I know I am not an "opinion leader". I am not charismatic. I am not compelling or especially eloquent. Still, I think it's important to voice my opinions. Not because I can singlehandedly sway the discourse, but rather because my voice may add to a chorus that might [with enough voices] sway the zeitgeist. Back in May, I was unable to imagine that just a few short months later I'd be living in an America where not only is bigotry widespread [this may always have been the case] but where it is socially tolerated, allowed to be boldly expressed without the majority standing up and saying "that's unacceptable". I am thinking here of two specific issues that have been dominating the discourse recently. First is this business about the "Ground Zero Mosque", which is not a mosque and is not at Ground Zero. Ultimately, the whole kerfuffle amounts to one thing and one thing only: bigotry against Islam/Muslims. We hear all sorts of people yammering about the various ways they're choosing to couch the discussion in ways that seem like it's not about bigotry. There's the absurd "where's the money coming from?" angle. Absolutely irrelevant! Nobody, and certainly nobody with a national television audience, is investigating the financing of anybody's Evangelical Christian church (or megachurch), although the nutjob apocalypse-boosterism that is built into that whole movement is every bit as radical and dangerous as the nutjob jihadism that is a [small, if vocal] part of the Islamic world. The differences worth pointing out here are (1) the nutjob apocalypse-boosterism has influence over a very significant and rapidly growing percentage of America's elected offices (which makes it significantly more of a threat to our way of life inside the borders of this nation) and (2) the nutjob apocalypse-boosterism finds its home under the socially acceptable umbrella of "Christianity", which gives it much more leeway for radicalism without scrutiny than is afforded to Islam. There's also the "we're not bigots, we just think there should be understanding for the sensitivities of the 9/11 victims' families" angle. Again, absurd. If the families are bigoted, OK. Let them be bigoted. But don't come to their defense as if the bigotry isn't bigotry just because they happen to be victims. It is easy to draw a theoretical parallel to a majority-white community in which somebody has been a victim of a crime committed by a black person. Or, for that matter, a majority-black community in which somebody has been a victim of a crime committed by a white person. If this crime should act as a trigger for racism in some segment of the community, would any sensible person be standing up in support of that racism? Would any sensible person be saying "it's perfectly reasonable and absolutely acceptable to project your feelings towards the criminal onto his/her entire race" and "we need to take sensitivity for your racism into account in determining whether it's acceptable to build a church in this community that will draw its membership primarily from members of that minority race"? I don't think so. And I really hope not. The second issue I've been thinking about is this idiot pastor who threatened to burn a bunch of Korans. This is a bit of a trickier issue, isn't it? It's a free speech issue, isn't it? How can I be all in favor of Everybody Draw Mohammed Day while being opposed to this Koran burning idea? It's hard to put my finger on it exactly. I think it's something like this: The difference is between on the one hand [Everybody Draw Mohammed Day] saying "you can't impose your religion on me" and on the other hand [Koran burning] saying "your religion is unwelcome here in my country". Yeah, I think that's a fair way of stating the difference. I will not allow you to tell me, because you believe in some particular superstition, how I am and how I am not allowed to act. But I also will not tell you that you are not my countryman, my neighbor, my equal just because you choose to live your life in accordance with your particular superstition. This country, at its best, is a country that is founded on the idea that you are allowed to believe in whatever superstitious nonsense you choose, but that you do not have the right to impose that superstitious nonsense on anyone who does not believe it. "Freedom of religion" is the phrase we use to sum that idea up. And it's one of the core principles of this nation. The Koran burning that the nutjob pastor was proposing was antithetical to that. It was based on hatred, intolerance, and bigotry. And it was all about bullying and trying to restrict freedom of religion. And we need to do what we can to ensure that his attitude is not allowed to become mainstream. Maybe we can build a respectable zeitgeist.